Keeping kids busy can take effort, whether you're looking for something for your own kids or an entire classroom of children. Finding crafts for 10-year-olds can be especially difficult. Many crafts are either too easy or too hard, or may just not be cool enough to entertain technologically savvy tweens. Try these ideas for year-round fun for bored kids. 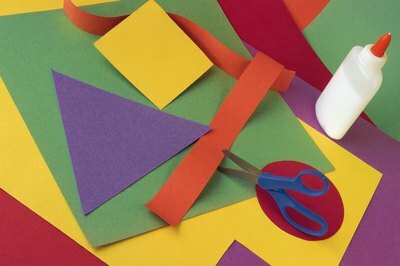 Paper crafts remain a good option for older kids, particularly if you offer a variety of supplies and allow them to explore their own creativity. Scrapbooking projects are a good choice for both boys and girls, especially if they have photos of a vacation or outing with friends to use in the project. Origami is an excellent option for independent crafting for older children. Kids this age may also enjoy experimenting independently with marbling paper, using blo-pens on paper, or hand painting paper. Encourage them to use their creations to cover books or journals, and pencil holders or boxes, because using their craft for functional items are likely to appeal to kids. Set a group of 10-year-olds loose with a large pile of boxes, washed-out cans, oatmeal tubs and an assortment of containers. 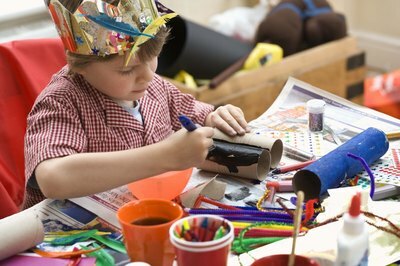 Add a roll of brown paper or butcher paper, masking tape and duct tape to keep kids busy for hours. Kids can create a town, a castle, a dollhouse or a space station. Clear plenty of space for this building activity, and you may even find that it provides entertainment for several days. On a smaller scale, kids can decorate old boxes or containers to use as storage around the house, make birdfeeders from milk jugs or build robots from just a few bits and pieces found around the house. 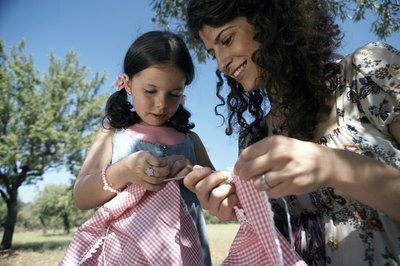 Ten is the perfect age to learn some basic sewing skills. While they might be bored by sewing a pillowcase or learning to sew on a button, most 10-year-olds will find making quirky and fun stuffed toys a great way to pass an afternoon. Allow them to turn their own drawings of monsters, animals or even their friends into simple stuffed toys. Use embroidery stitches for facial features. They might even learn a bit about how to manage a needle and thread along the way. Use felt, fabric or even old clothes for these sewing projects.